About a year ago, the Renault-Nissan-Mitsubishi Alliance promised that by 2022 it will offer 12 new all-electric cars, but since then the only major change was upgrading of existing models. The goal is of course still in progress, re-confirmed recently by the way of deal with Google, to incorporate Android operating system in new Alliance models, but first RNMA needs to develop new platforms/components/etc. if it would like to stay competitive in the rising EV market. New BEVs are popping out almost every month and many of those like the Hyundai Kona Electric, Kia Niro EV or the latest Audi e-tron are increasing the bar significantly in their segments. “The infotainment partnership forms part of Alliance moves to equip more vehicles with connectivity and cloud-based services as part of its Alliance 2022 mid-term plan. Today’s announcement, coinciding with the first anniversary of the mid-term plan, symbolizes the Alliance focus on next-generation technology. Under the plan, Renault-Nissan-Mitsubishi is targeting increased sales of more than 14 million units a year by the end of 2022. Renault-Nissan-Mitsubishi Alliance is the biggest manufacturer of plug-in cars (almost 100,000 YTD through the end of July), and even if it will soon become outsold by Tesla, it’s important for the Alliance to expand. Recently, Renault introduced the Master Z.E. all-electric van, but it’s low-volume and with a relatively small battery of 33 kWh shared with the Kangoo Z.E. In the case of Nissan, we wait for the all-electric IMx, but some says it’s 2 years away. And, of course, we’re all still waiting for the 60-kWh LEAF, which Nissan says will arrive in the future. On the pros side, the Alliance upgraded many of its existing plug-in cars recently – Renault ZOE, Renault Kangoo Z.E., Nissan LEAF, Nissan e-NV200 and Mitsubishi Outlander PHEV. 34 Comments on "Renault-Nissan-Mitsubishi Reveal Plans For 12 New Electric Vehicles"
Good, as much as I like Nissan, they (and maybe everyone else that make car) doesn’t seem to know how to make a good nav system. Happy to see that google will put love in Android car and should be stock in car. Our Leaf always gave me the impression that it was designed by two committees that couldn’t agree on anything, so they put BOTH displays in……. With Android in one’s car, Google would be able to accumulate and sell more information about you. No, thanks! How is that going to play with iPhones and iOS? I said so in another comment section, after 2020 all hell will break lose and the established manufacturers will chuck out millions of EVs. I hope you’re right. Because the perpetual 3-5 year can seems like it’s still getting kicked. I’ve said it several times before. Bob Lutz just said in a CNBC interview that Tesla has no real advantage over the big boys and also said what I’ve been saying about the big boys being able to take losses on EV’s because, unlike Tesla, they also have ICE vehicles working for them. He predicts Tesla will be killed due to the financial hole they’ve been digging and will continue digging. But would you be willing to make a wager, say $5000. USD? For some reason, I can’t seem to find anyone bold enough to put up for a wager, who talks like you do. How about a $50. wager that Tesla shows non-ZEV credit profitability this quarter? Some people who talk the way you do have bet a lot more on short-selling TSLA stock. That is sickening if accurate, but likely also true. I also felt that 2018 was going to be much further along EV adoption than it is. While I’m glad to see plans, I’ve learned, from here and other sites, that VW is full of broken promises. I am very glad to see Jaguar, of all brands, create a compelling BEV product, and Audi to put their best efforts into a price-competitive model as well. What will turn the corner is the $100 / kWh battery price point. So far, Tesla is in striking distance of that, to the chagrin of Bob Lutz’ bloviating scare-mongering. Bloviating is the appropriate word, indubitably. It’s not true that they aren’t doing anything right now. They *are* working on all these upcoming vehicles — it just takes time. By 2021 or so, a lot of compelling new models should actually start selling. Nissan first mention a family of EV’s and more and more EV models was in 2015, I believe it was at the Japanese shareholders meeting. Even though, they are taking their sweet time over it. 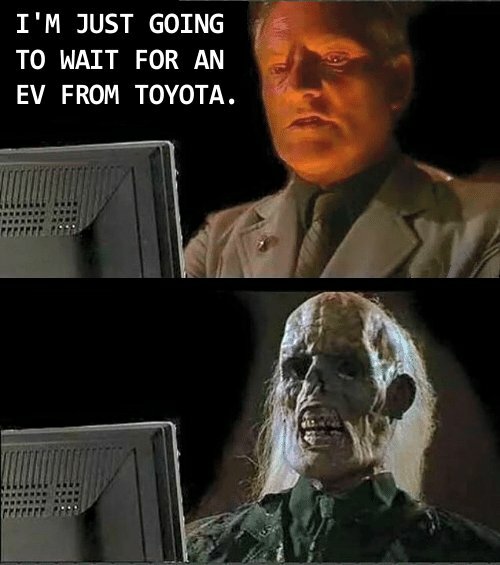 I’m waiting for Toyota, Honda, Mazda, and Subaru to introduce their EV’s. Your hour glass is gonna run out of sand. waiting. If all goes according to their plan. I’d love to see this. Hopefully they’re not all slated for China. With Audi, Porsche and Jaguar looking like they’re actually serious about producing EVs, hopefully Nissan and VW are too. Hyundai and Kia’s EVs look great but they’re such low production. I expect Nissan to follow through, but VW has always talked a good game but never produced, so maybe they’ll get to their plans of large scale production, but I’m not sure they’ll be at 1 million per year by 2025. Nissan better get on it though, with competition coming from Kia, Hyundai, VW, and hopefully Honda’s upcoming Fit EV. VW (including Audi and Porsche) is supposedly planning for 3 millions by 2025. 6 in 2022 – PIzazz (Leaf3 in CUV trim), Sparkle (Zoe3 in CUV trim), etc. It’s about time. Nissan has been dragging their feet on EV upgrades for many years now. The LEAF is largely obsolete in a world with the Chevy Bolt and the Tesla Model 3. The Leaf costs some $7,000 less than the Bolt. The first of those twelve was the Renault Master. The second of those promised new cars started production in China recently, the Nissan Sylphy, a sedan with the Leaf powertrain. The third and fourth will likely be an electric Nissan Qashqai (Rogue) or Renault Captur. The van is low volume to establish a present in that market. The other three are higher volume models, all three will be expected to sell well over 100k/year. The sales will be mainly in China and Europe, with some in Japan. Perhaps the Nissan Rogue will come to the USA. Renault is making Kwid EV intended for China and Indian market. It is a bit smaller than Zoe. I better still have the option to add Apple Car Play or I will never buy one. It’s too bad you guys couldn’t come up with a compact EV cargo/delivery van for North America. You know, a 40kWh or 60 kWh version of the NV200 with thermal management. Sure it’s crazy talk. I know, I’m delirious and totally incoherent from too much medicinal single malt scotch. Of course that’ll never happen stateside. So don’t eat into the Nissan Titan market share… Carlos, just give up on this EV fever dream.